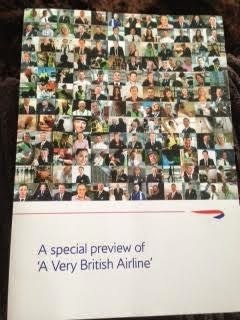 Last November, I took part in the filming of the BBC documentary: 'A Very British Airline'. A three part series, the first of which was aired yesterday evening. 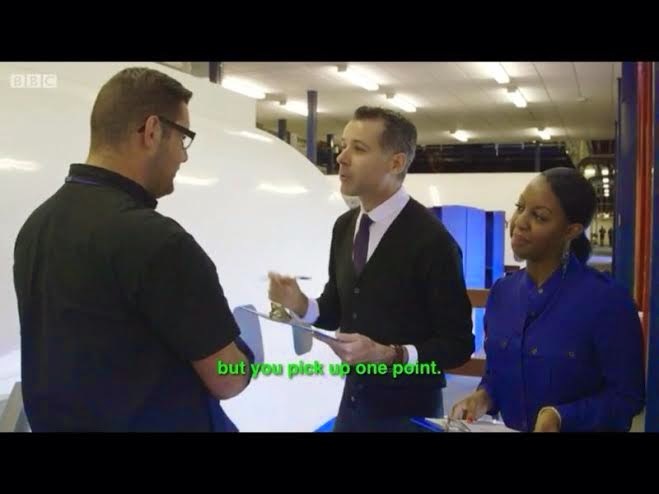 I was filmed doing my job as a Cabin Crew safety trainer (SEP, for those in the know!) which basically means as part of my job I train the new crew recruits in their safety and emergency procedures e.g. evacuating an aircraft in an emergency, survival training etc. I had been waiting for this programme to come on for the last 6 months, as it had been filmed in an 'observational style' which meant the camera crew followed our every movement and recorded every word! It has been nerve-wracking waiting to see the final end result, not to mention how it would all be edited! - but I can say I was pleasantly surprised and very pleased with the first episode. 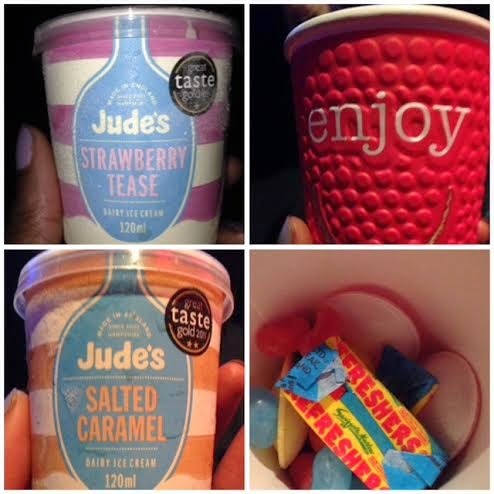 Everyone who took part during the filming was invited to the British Airways HQ (Waterside)yesterday for a 'pop-up cinema' preview of the programme a couple of hours before it was aired. We were greeted with drinks and gorgeous canapés in the Waterside theatre. I instantly recognised Alice, a pretty, petite girl who is featured as one of the recruits that I trained. Alice has also become the unofficial 'face' of this programme and has appeared in extensive promotional releases about the show (see her above in BBC promo picture). I could see she was nervous but excited to see her journey documented on the small screen. There was a collection of faces from all around the airline, from Pilots to airport staff all expectant to see how their contribution to this huge milestone of becoming BA history would unfold. 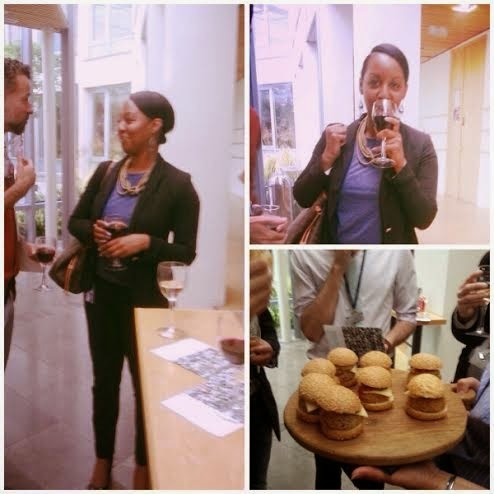 Enjoying the complimentary drinks and canapés at HQ! We had a brief introduction by our Executive Chairman, Keith Williams. He informed us that there was nearly 200 hours of footage filmed with almost 600 colleagues and thanked us for all our hard work and input before being led into the theatre. I took my seat, anxious....I knew how hard our training department worked at getting new recruits to perform correct safety drills and procedures and ensure they get to the required legal standard before they go on to start their Customer Service training. The training is intensive and British Airways are known for their exacting high standards - With so many hours of footage shot, I hoped that all our good work as a training department hadn't ended up on the cutting room floor. I needn't of been nervous, in fact a great deal of the episode was about the new recruits and their training experience. There was small footage of us, the safety trainers, taking the Cabin Crew to the pool where they perform 'wet drills' (swimming and treading water unaided before getting into a life raft). It would have been great to see more of this element as it shows how in depth and serious we take survival training but the BBC had sole control of the editing and ultimately what was shown. I was seen assessing the recruits on their fire training and also during their slide descents- where crew have to evacuate themselves onto a real life Boeing 747 and Airbus slide. This always generates either excitement or sheer terror for the new recruits!! The documentary showed the real side of the Cabin Crew training experience by focussing on how the recruits are assessed. Not everyone makes it through a BA training course, as our expectations as you would imagine are very high. This was particularly shown in the programme when the new recruits were completing their Customer Service training. BA is synonymous with 5 star luxury brands and the crew have to be able to show that they are competent and able to achieve that level of service. Although I don't work in this department, having been Cabin Crew before (a long time ago now!) I can see why they are so exacting. It is a really different world when you go 'online' and the recruits have to be prepared for that. Ultimately, it's what the customers expect too. The rest of the show, showed the deliverance of our first A380 and its inaugural flight. Although I know the future of the Cabin Crew recruits shown, I won't give anything away! Part 2 will be aired next Monday 9th June and then the third and final part, the following Monday 16th June. If you watched 'A Very British Airline' Part One, let me know what you thought. Ahh glad you like the programme! Cabin Crew training is intensive but there's a great and rewarding job at the end of it...look forward to seeing you at BA-apply! !